Summary: VERY hot and humid over the next few days. Rain chances come back tomorrow for the rest of the week. Watching a tropical storm for rain chances later in the week. It’s going to be a very hot and humid next several days in Middle Tennessee. Today, our high temperature is expected to reach 93 degrees. Our dew point temperatures, however, will be in the low 70’s, which translates into about a 99 to 103 degree heat index. It will be sunny today with winds out of the south southwest at 5 to 10 mph, bringing in more of that moist air. We are not expecting any rain today as a high pressure system is dominating our weather, keeping rain chances out of the area today (indicated by the blue “H” in the graphic below). The heat and humidity for the next several days as promoted NWSNashville to issue a Special Weather Statement. You can read the full statement here. It’s important to stay hydrated and take frequent breaks from the heat and sun. Also, try to plan outdoor activities before 10am and after 3pm, as that is considered the hottest part of the day. Tonight, temperatures are only expected to fall to about 72 degrees under clear skies. Winds out of the south southwest will die back to about 5mph then to calm. Rain chances return Tuesday with a 20% chance of rain and thunderstorms with a high temperature of 92 degrees. Humidity will still be around too, so heat indexes will range from 97-101 degrees. The high pressure system will slowly move out of the area, opening up chances for pop up showers and storms from the heat and humidity of the day. Tuesday night, any rain in the area will likely fade away, leaving us with partly cloudy skies and an overnight low temperature of 71 degrees. Wednesday brings a repeat of Tuesday, with 20% chance of rain and a high temperature of 92 degrees. Any rain will likely be from pop up showers or storms. Wednesday night, however, rain chances stick around at 20% chance of rain and storms with an overnight low temperature of 72 degrees. Late part of the week our eyes turn to a tropical system from the Gulf to influence our rain chances. We have our eyes on the current Gulf of Mexico tropical disturbance (named Invest 91L). Once it comes inland, it will mix with our jet system and be sent toward the east coast. The “spaghetti tracks” for this system (plotted path lines of where different models believe this disturbance will go) currently shows that the system will impact Kentucky and not us. Breaking down this chart: it shows the system will likely impact Kentucky at around the 96 to 120 hour mark from when the chart was made (12z June 15). 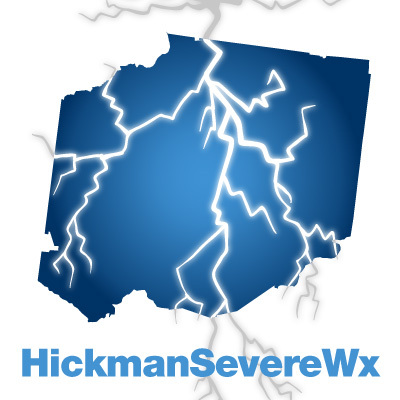 In plain English, the disturbance is generally expected to be in Kentucky around 7am Friday (96 hours from 7am June 15) to 7am Saturday (120 hours from 7am June 15). While the center of this system is expected to go north of us, we can expect a slight increase in our rain chances as the disturbance moves through since it will likely carry rain and thunderstorm with it for about a 100-150 mile radius from the center (the center being the plotted lines above). Thursday, or rain chances are only slightly higher than they were on Wednesday, to 30% chance of rain and a slightly cooler high temperature of 90 degrees. 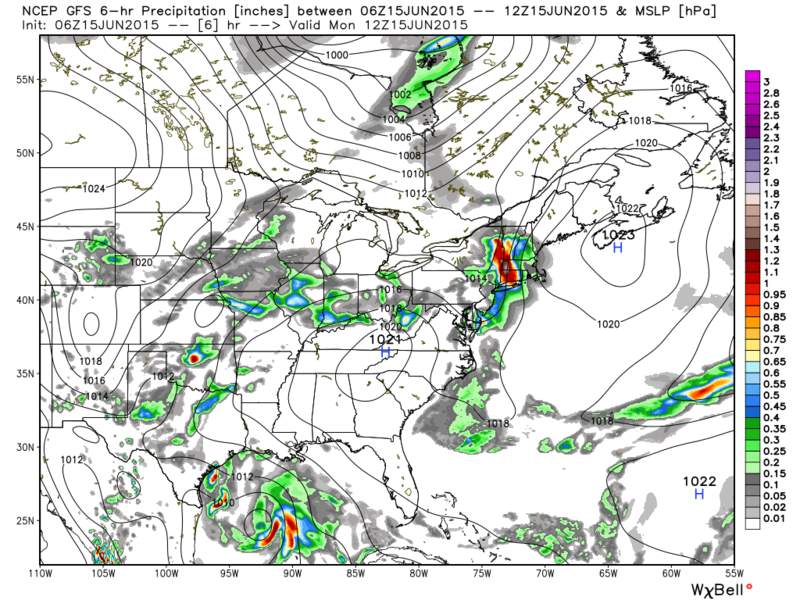 Here’s a glimpse of the rain expected on Thursday at 1pm from the GFS model. Thursday night holds the same rain chances at 30% and a mild overnight low of 72 degrees. Friday our rain and thunderstorm chances go up slightly to 40% chance and a even slightly lower high temperature of 89 degrees. 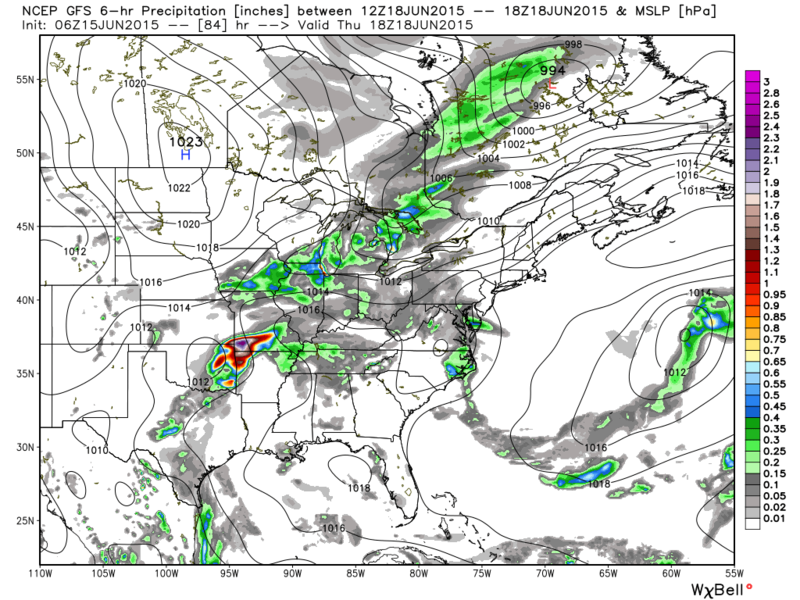 Here’s a look at the rain chances for Friday at 1pm from the GFS model. Depending on the track of Invest 91L, rain chances for Friday and Saturday could change. If the center of the disturbance heads a bit more south, our rain chances will go up. Conversely, if the center heads more north, our rain chances may slightly decrease. 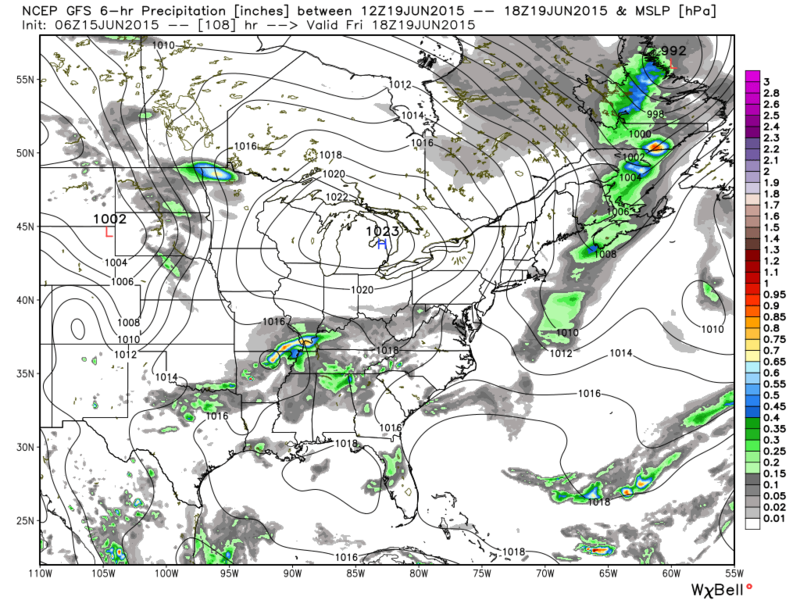 The weekend may start of a little wet, but Father’s day is going to be mostly dry. 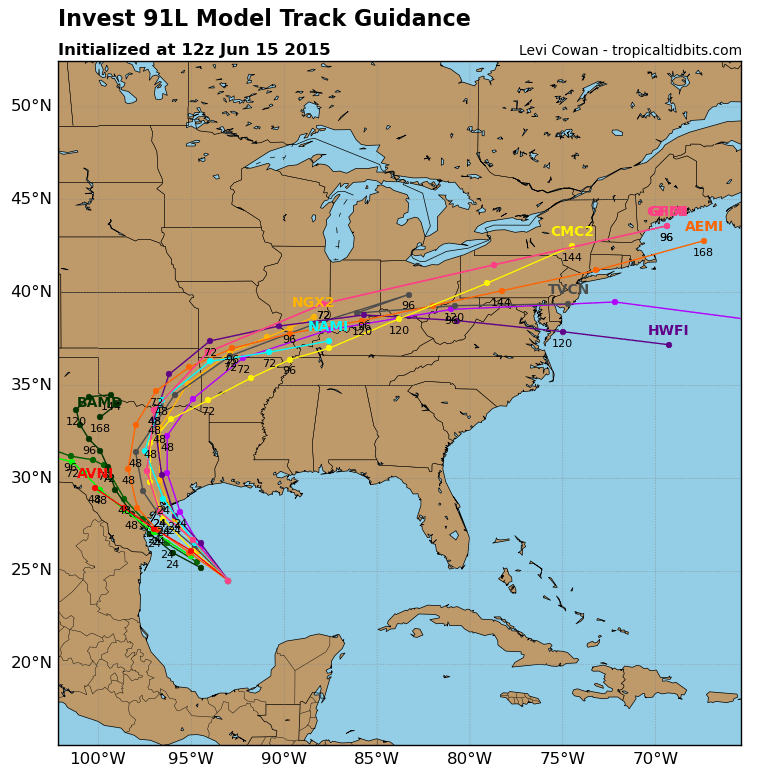 The track of Invest 91L will determine our rain chances for Saturday. Currently, the forecasted rain chances for Saturday is at 40%. Saturday’s high temperature will be about 89 degrees. Father’s Day Sunday there is a 20% chance of rain and thunderstorms with a high temperature of about 91 degrees.